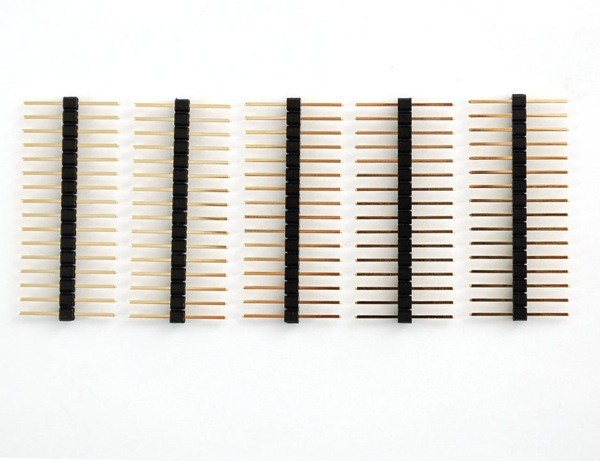 NEW PRODUCT – Extra-long break-away 0.1 18-pin strip male header (5 pieces) « Adafruit Industries – Makers, hackers, artists, designers and engineers! BY POPULAR REQUEST! NEW PRODUCT – Extra-long break-away 0.1 18-pin strip male header (5 pieces). Breakaway header is like the duct tape of electronics, and this header is one better with extra long pins on both sides. This makes it great for connecting things together that have two sockets – especially solderless breadboards. We also use these with our female-female socket jumpers to create female-male and male-male jumpers! Each pack contains 5 x 18-pin long headers, 0.1″ pitch, that can be stacked next to each other on a 0.1″ grid and broken apart easily with pliers or diagonal cutters. They’re even gold plated so they wont oxidize! Other than posting it right after I placed an order rather than right before I did. This is a wonderful addition.